Months before the publication of the April 2010 issue of the Ultrarunning Magazine, Ben Gaetos, a BDM 102 veteran and ultrarunner from Los Angeles, California, sent me an e-mail informing me that the article I sent to Tia Bodington of the Ultrarunning Magazine last year will be published in the April 2010 issue of the said magazine. I was so excited about this information as this will serve as a venue for the ultrarunners in the United States and other countries to be aware of the presence of an ultrarunning event at the very same place where history happened in the last World War II. My reply to Ben Gaetos was to request him to buy one copy for me as I thought that the said magazine is available in the newsstands, magazine stores and bookstores in the United States. I found out later that the said magazine is only available to subscribers. Last week, I was surprised when I received a copy of the said magazine from Ben Gaetos which he sent through First Class on the US Postal Service. Thanks, Ben for sending to me your subscription copy of the Ultrarunning Magazine. I hope you will send also your personal Race Report for the 2010 BDM 102 to Tia Bodington this time. We’ll expect that to be published on the April 2011 issue of the said magazine. It started as a dream and it became a reality. Having been a retired Two-Star General from the Armed Forces of the Philippines last year and a passionate runner, I thought of conducting an ultramarathon road race by adopting the actual route of the infamous Bataan Death March that happened on April 6-15, 1942 after the US and Philippine Forces surrendered to the invading Japanese Imperial Military Forces. This March resulted in the deaths of almost 700 US soldiers and 20,000 Philippine troops and Auxiliary members due to the atrocities of the Japanese soldiers, lack of water & food, weak bodies due to diseases, and the scorching heat of the sun during the day being April as the peak of summer hot weather in the country. In memory of our heroes, this ultramarathon race was dedicated to them in celebration of the country’s National Heroes Day. The other purpose was to promote ultra running events in the country and develop future ultra runners for international exposure. Lastly, I would like to make this celebration as an annual running event to raise funds for the living survivors of the Bataan Death March in the country who are few and proud to have served to defend the country in the name of freedom and democracy. A total of 82 runners, consisting of 8 runners from other countries (US, Japan, France, Indonesia, and Singapore) and 5 lady runners, became part of history of this ultra road running event as they started the race at 30 minutes passed midnight of April 4, 2009. The event followed the actual route where our heroes had to walk from the coastal town of Mariveles, Bataan up to the Old Train Station in the City of San Fernando, Pampanga covering a distance of 102 kilometers. Runners started their uphill climb after 3 kilometers from the Starting Line, traversing the first mountain along the route. The next 35 kilometers would be a roller-coaster run with uphill and downhill as more towns would be reached and passed by the runners. The next 60 kilometers and down to the final stretch of the race are all plain but the heat of the sun would be the most important concern among runners in order to have the strength and endurance to reach the Finish Line. Each runner was encouraged to bring with them their hydration belt, at least, one container for water and another one for their sports drinks for mineral replacements. The Aid Stations were located every 20 kilometers while 3 Roving Aid Stations aboard vehicles were constantly in touched with the runners, giving bottled water and sports/energy drinks and food along the way. At the Halfway mark (Km Post 50), an Aid Station was available to serve breakfast to all the runners and it became a recovery point for Drop Bags of the runners. Three (3) Ambulance Vehicles were available moving with the runners and One Ambulance was dedicated to follow the last runner of the event up to the Finish Line. The first half of the race was a test of patience for all the runners. But the second half was a test of endurance as the heat of the sun would reach up to 100-110 degrees Fahrenheit and this condition would slow down most of the runners. Due to proper information and previous “test run” along the second half of the route two months before the race and long runs along the main streets in Metro Manila during daytime, runners knew how to deal with the early signs of “heatstroke” and the finishers were proud to have overcome such condition and challenge along the way by applying those preventive measures they have learned from their past long runs and training. Out of the 82 starters, 63 runners were declared Finishers beating the cut-off time of 18 hours. Out of the 5 lady runners, 2 of them finished the race within the prescribed time. Each finisher was immediately awarded with a Finisher’s Medal, Finisher’s Trophy, and Certificate of Finish immediately after passing the Finish Line. To top it all, a separate Awarding Ceremony Dinner Party was held at the Philippine Army’s Officers Club with all the participants and sponsors celebrating as a community of ultra runners, a week after the running event. The race was a successful one and more runners had already signified their intentions to join in the next year’s edition of this ultra road race. The 2nd edition of the race will be held on the midnight of March 6, 2010. 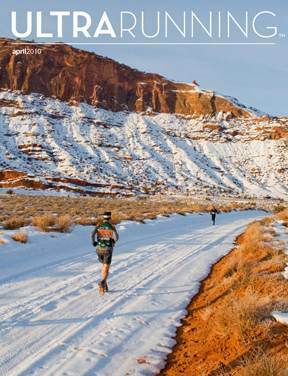 The 3rd edition of the BDM 102 is now listed among the Ultra Running Events in the Calendar Link of Ultrarunning Magazine. However, an additional calendar entry will be requested for the 1st BDM 151 soon. Please check at www.ultrarunning.com. i have that copy although i didn’t read much about the Bataan story. anyway, I stumbled upon your blog and definitely i’d go back and finish the story. cheers. Your welcome Sir. You worked extremely hard to put BDM 102 together. The article is just icing on the cake. Tia Bodington is also the RD of Miwok 100k near San Francisco to be held this Saturday, May 1.
sir Jovie can you bring a copy of that mag next sunday, during the Tanay ultra 50K? so we can take a peek? how can we order of that issue kaya?